Today Samsung on 03rd April unveiled their new gaming laptop called Samsung Odyssey Z in China. The company doesn’t announce the price till now. The Samsung Odyssey Z comes with the latest Intel 8th generation Core i7 processor along with NVIDIA GTX 1060 MAX-P GPU for unleashing gaming performance. This GTX 1060 MAX-P GPU offers 10% more processing power than the previous generation GTX 1060 MAX-Q GPU. The notebook coupled with 6GB of 2,400MHz LPDDR4 RAM and 1TB of NVMe (Non-Volatile-Memory-Express) based SSD drive. The laptop has the stereo 1.5 Watt speakers with a nice red-colored LED backlit keypad. The model name Odyssey Z describes as “Fairly thin and light-weight with multi-core processor”. The 6-cores and 12-threads are really capable of doing multi-tasking and graphics intensive gaming with an ease. 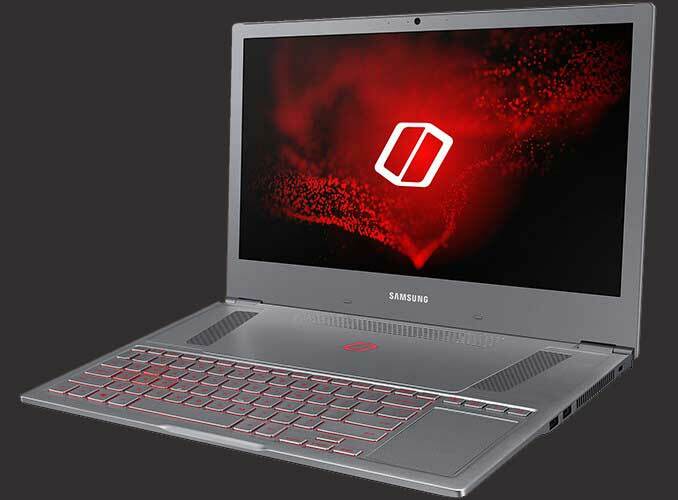 The Samsung Odyssey Z comes with a 15.6-inches of Full HD IPS LCD display with 1920 x 1080P resolution looks quite good and the metal unibody frame looks quite promising in terms of flagship gaming laptop. The laptop comes with a 6GB of LPDDR5 GPU which cools the device faster with Aero Flow and the help of “Dynamic Spread Vapour Chamber” that covers both CPU and GPU. There is a shortcut to start the recording while gaming and another shortcut for trigger the fan in silent mode, which will bring the fan noise to 22dB. The USB ports are enough to plug in VR headset also. The laptop comes with a 54 Watt-hours battery that won’t last for a long in gaming mode. Still, Samsung manages to provide a 180 Watt adapter in the box. The trackpad is placed on the right side of the keypad and all the keypad portion featured with RGB. The nice red inline borders across all over the keyboard look pretty decent. The Odyssey Z is only 17.9mm thick and it weighs around 2.4 kg. The upper and lower portion of the body is textured and stripped in 3D graphics. The Z comes with USB-C port, USB 2.0 and USB 3.0, HDMI ports, a 720P webcam etc. It runs on Windows 10 out of the box pack. There is only a single Titan Silver color available right now. The laptop will be available first for sale in China and US market. The price will be released before few days of sale.